Calling all adventurers! The wildflowers are blooming and summer, with its sunshine and warmer temperatures, is finally on its way. And while we love summer and its myriad opportunities for outdoor fun (like camp!) we’re also looking ahead to fall as we gear up for the next troop year. And we’re excited to share that there’s so much to do in western Ohio in 2018-2019! 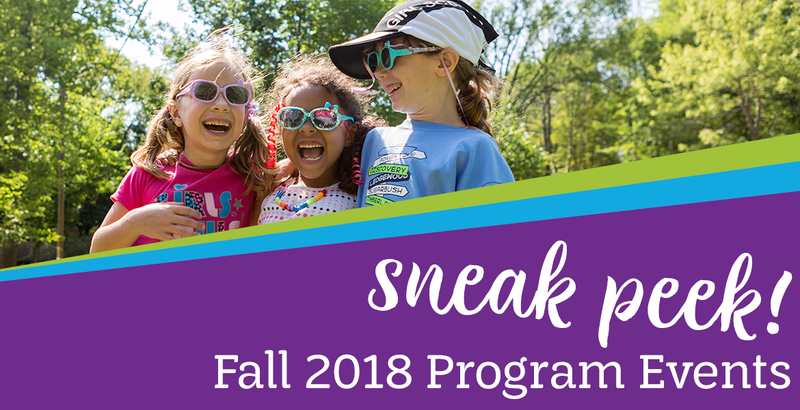 Here’s a sneak peak of just a few of our fall 2018 events to whet her appetite for adventure. Check out the full list in June on our Activity Calendar and sign your Girl Scout up for her favorites! Registration for our fall 2018 events starts on June 6, 2018. A family event where everyone can join in the fun! Oh the places you’ll go and the things you will do, when you believe in a girl-led experience! Come meet our community partners and have a expo-style hands on experience of what they have to offer. Pick and choose your favorites and plan for a fun-filled year! Build with Legos, play with robots, meet a sloth, create amazing art, shoot hoops, sing-a-long with a princess, change a car tire and so much more! Choose your adventure and plan your Girl Scout year to be nothing short of spectacular! Fun patch included for girls only. Do you know a girl who wants to join Girl Scouts? She can come with her family too and check out all the fun the Girl Scouts have. All ages welcome, cost $5/participant. Experience an overnight adventure with a special male adult in your life. Shoot archery, tackle the climbing wall, make a craft, take a hike, and learn useful outdoor skills together. Sing camp songs and roast s’mores around the campfire, before getting a good night’s sleep. For Daisies through Cadettes. Cost is $40/participant. Brownies, nothing beats the taste and appeal of a meal cooked over the campfire. Explore the basics of outdoor cooking over a flame on a grate, including how to prepare one-pot meals, set up and clean up after a cookout, and how to use a skillet. Learn about fire safety, including what to wear, how to light a match, and how to build a fire. Juniors, cooking over coals provides many options for preparing tasty outdoor meals! Learn how to use a charcoal chimney and how to judge your cooking temperature based on the number of coals. Prepare and cook with a dutch oven, cook using foil, and learn to take care of cast iron cookware. Cadettes, be the envy of the camp when you cook at camp outs! Learn the art of making and using reflector ovens, explore several fun novelty cooking methods, and more. Troops must provide appropriate ratio for these events, and individual girls must register with an adult chaperone. Cost and times vary by workshop. Brownies and Juniors cost $8/girl and $3/adult, while Cadettes, Seniors, and Ambassadors are $10/girl and $4/adult. Come to Challenger Learning Center and learn about space and robotics. Girls will earn the What Robots Do Badge and the How Robots Move Badge. Science is fun! Cost of $20/girl includes two badges. Not a Daisy? We have a Brownie Robotics event at the Challenger Learning Center scheduled for January 19, 2019. Registration for it will open in November 2018. You are cordially invited to an evening of mystery and intrigue at the esteemed Mystery Soiree. Arrive in your best formal attire and be prepared to get sleuthing. Girls will discover a mystery and learn how to solve it through fingerprinting, handwriting analysis, and more! For Juniors and Cadettes, cost of $12/girl includes Junior Detective or Cadette Special Agent badge. Girl Scouts always leave a place better than they find it – even when camping. You’ll spend the day learning about minimal impact camping and how to protect the environment on your outdoor adventures! You’ll learn about the Leave No Trace principles and how to recycle a pizza box into a solar cooker. You’ll build on your knot tying skills and take a conservation hike. For Juniors, cost is $8/girl. Can’t make that date? No worries! We have two more Eco Camper workshops scheduled in April of 2019 at Camp Woodhaven in Lima and Camp Libbey in Defiance. Registration for 2019 events opens in November 2018. New this year, Kinderbots! Have you ever wondered how robots work? Have you ever thought about building a robot to help clean your room, feed the dog or play fun games? Work toward your Programming Robots badge and receive badge at completion. Led by staff from Snapology, this workshop for Brownies costs $14/girl. Can’t make that date? We have more Kinderbots workshops scheduled at our Girl Scout Center in Toledo on October 20 and December 8, 2018. What does a “perfect” world look like? What issues would need to be resolved to make this world perfect? Together we will dive into the issues for girls in our world and decide what we can do about it all while completing the Discover and Connect portions of the It’s your World, Change it: GirlTopia and Your Voice, Your World Journeys. The completion of the journey can be used towards the prerequisite of the Girl Scout Gold Award. For Seniors and Ambassadors, cost is $45/girl and $20/adult. Come one, come all to the Lady Bug Ball! Wear you buggiest attire and enjoy some genuine bug fun! Learn all about bugs, do a bug craft, enjoy face painting, scavenger hunt, a photo booth and more! Brownies will work toward their Bugs badge. For Daisies and Brownies, cost is $12/girl. Put your paddling skills to the test on this overnight canoeing adventure. Head to camp on Saturday morning to prepare for your trip, and learn the proper way to pack, store gear, and keep it dry. You’ll also get a chance to freshen up your canoe skills with a quick practice session before setting off down the river. In the late afternoon pull off at a local park, make camp, and cook dinner. Sunday after breakfast you’ll get one more opportunity to canoe, before catching a lift back to camp. Participants should have previous canoeing experience. Troops must provide appropriate ratio for the event, individual girls must register with an adult chaperone. For Cadettes, Seniors, and Ambassadors cost is $25/participant. Find out what the outdoors can offer you! Grab your favorite adult, and experience a jam packed adventure full of non-stop nature activities, games, crafts, hikes, songs, and snacks. Adults will have fun experiencing right along with their Daisies. Cost is $5/ girl. Unite with your Girl Scout sisters to pay homage to the founder of Girl Scouts, Juliette Gordon Lowe, through classic Girl Scout traditions. Learn the history behind Juliette’s passion for service-learning and discover the impact that you can make when you strive to serve your community. Explore the difference between Community Service & “Take-Action” by engaging with top-notch Highest Awards Alumnae from our council. Connect with philanthropic community partners to embrace the Girl Scout Promise and learn how to help people at all times. This program will culminate with a large-scale service project. If time and weather permit, there will be a hike. Please plan to bring a sack lunch. Price includes fun patch and snack. For Daisies through Ambassadors, cost is $6/girl. Daisy Girl Scouts, their parents, and leaders come to camp to earn the Daisy Outdoor Art Badge. Become more familiar with Camp Stonybrook, and the sounds and colors of the season. Everyone should wear their brightest color clothes and they don’t have to match! Girls will complete and share two art projects expressing the sounds and colors they have experienced while at camp. For Daisies, cost is $5/girl. If someone was sick or hurt, would you know how to help? But when you’ve had practice and learned what to do, it’s easier to stay calm! In this badge, you will learn how to help people when they are ill and how to respond to an emergency — from calling 911 to using first aid to treat minor injuries. When the unexpected happens, you’ll be prepared! Badge and first-aid kit included in cost. Workshops available for Brownies through Ambassadors. Are you ready for a year full of adventure and fun with the Girl Scouts? To go camping? Attend a ladybug ball? Program robots? This was just a sneak peak of the wide array of program opportunities coming for the 2018-2019 troop year! Set a reminder in June to check out ALL your options in our Activities List, choose your girl’s favorites, and register her for her next adventure in Girl Scouts in My GS at gswo.org!